Bohemian Parties and Murmurations – Travel. Garden. Eat. The Bohemians gathered and partied until one of their own crashed the event and ended the fun, all on a Sunday afternoon in northern Minnesota. The coast is clear — party time! Calling to his friends, the party invitation is issued. One, two, three, four . . . let’s get this party started! Incoming . . . party crasher! The remaining guests look miffed, as the party crasher remained unconcerned. 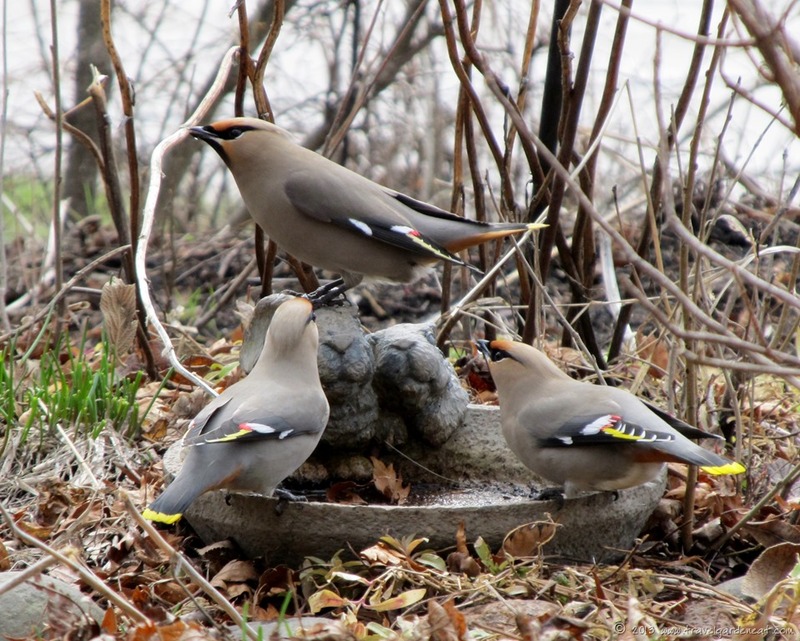 Bohemian Waxwings are such handsome birds; often confused with Cedar Waxwings, the rusty-orange undertails of this group of birds collecting at the water dish confirmed they were the larger Bohemian variety. A handy guide for telling the two varieties apart can be found on the 10,000 Birds website. 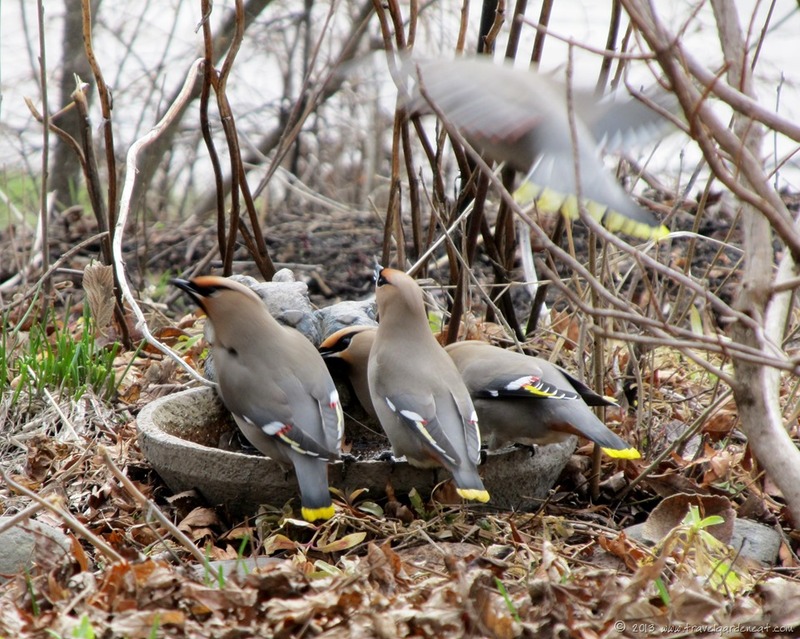 During the fall and spring migration seasons, we often have large groups of waxwings congregating in our crabapple and mountain ash trees, gorging themselves until they are intoxicated on the berries. Take the time to let the simple wonder of nature touch you at least once every day. Fun set of pictures; they are beautiful birds! I was happy with how they turned out as I sat on the front step and just zoomed in with my little point-and-shoot. Great photos! I love waxwings and have only ever seen two in my entire life. We have been fortunate to see the pretty Bohemians so frequently — such rich coloring! 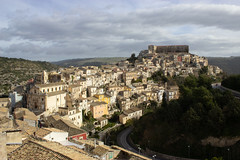 Great post, thank you; your photos and background information was very helpful. I have been using the CornellLab of Ornithology site. I went out to the 10,000 Birds site and have added this to my resource list to id birds. Charlie, Cornell has a wealth of good info, but when I came across the 10,000 Birds site, thought it had a lot of fun resources! Thanks! When I was a little girl, my mother gave me a bird book for Christmas. It was one of my favorite gifts and was the object of my attention on many summer days as I tried to identify the birds I saw. 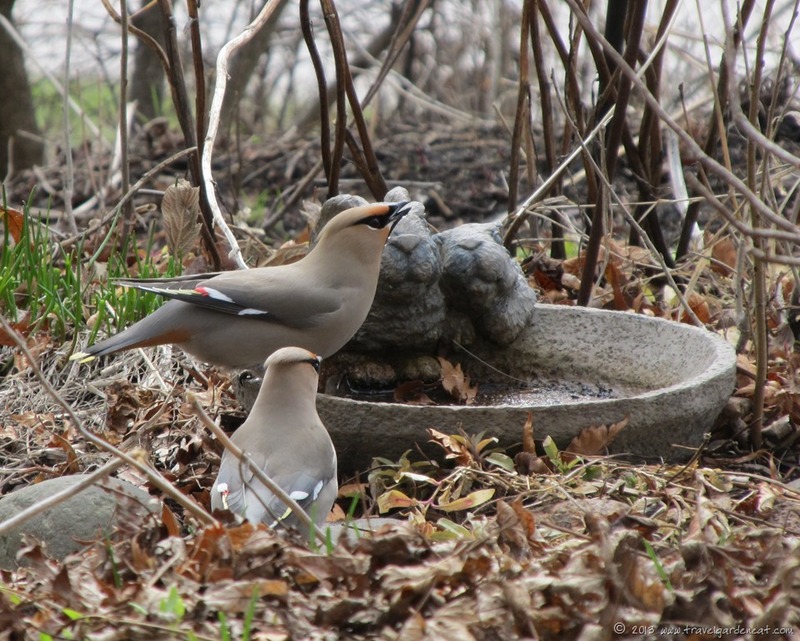 Though I never saw them in person as a kid, my most favorite birds in the book were waxwings. I recognized them immediately when I saw your photos! Thanks for the story and warm memories! So glad to help bring back a fond memory! That flash of yellow is eye-catching particularly when they gather together! Thanks, Madhu. I just read an article on the passenger pigeons — amazing story/history, isn’t it? http://ngm.nationalgeographic.com/2013/04/125-species-revival/zimmer-text — that’s exactly what I read — the latest National Geographic had an article on cloning, and the passenger pigeons’ history was part of it! Hate to admit that that is one of the issues sitting on the bedside table that I haven’t read… Now I really have to look! Ha! And it happens to be one of the only ones recently I have found time to read! Part of the fun of blogging — realizing some of those little things we take for granted, others may view as a special treat! They are beautiful! Thank you for posting the murmuration video. Have a great week! I think that murmuration video is just awe-inspiring — and the last view of one of the young women in the canoe, with that surprised, glee-filled look as she laughs at her friend — it says it all! What a great post and video! I’ve not seen waxwings of any kind here but I’ve seen them when I’ve gone North. Up until about 10 years ago, we had a flock of starlings — after watching the numbers in your video’s murmuration, I couldn’t possibly call it anything but a flock — that would gather and swoop every evening. Unfortunately, West Nile virus depleted it and it’s only started to rebound in the last couple years. Good to see there are still places in the wild where birds of a feather can play together. Even watching a smaller flock move in that manner is something that gives a person pause — but that video those women captured is amazing! I was awestruck by these photos! Beautiful, beautiful birds! 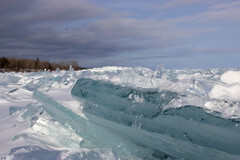 I am amazed you were able to catch them as you did in these photographs. 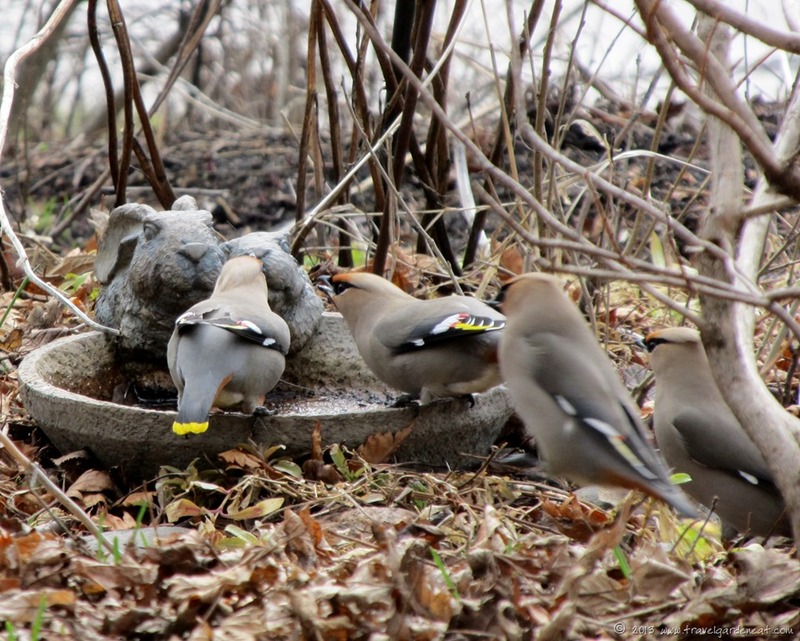 Was this a bird bath?? They seemed so interested. Just a little ground dish that you could use as feeder, bird bath, water dish . . . 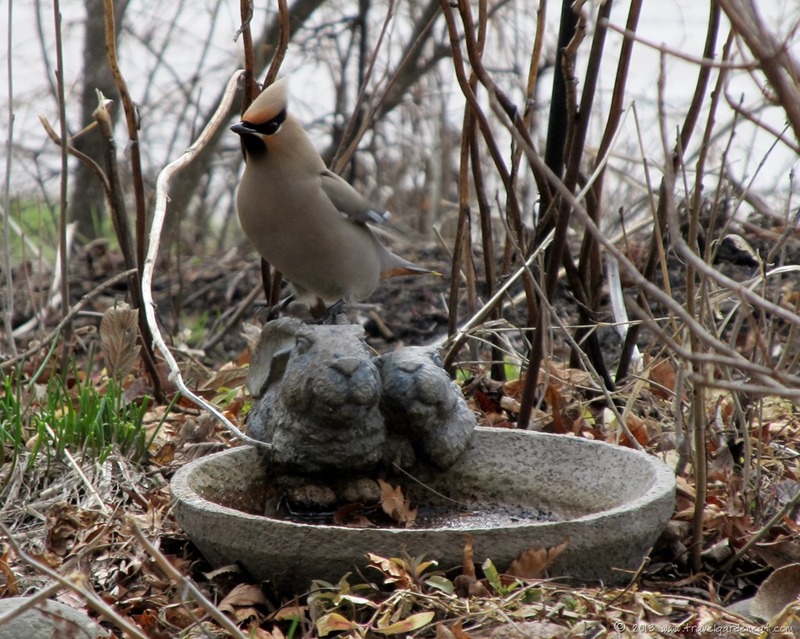 I have found that having some water sources on the ground and some at a classic bird bath height attract different kinds of birds. Fun to watch! OMG – wasn’t that video incredible. I’ve saved and love to watch it from time to time – so lovely. It is a video I have returned to on more than one occasion, too — it is so special! Fun party. The video is just so amazing. I never grow tired of seeing that video again! So nice! We hardly ever see these beauties. The few times we do–I feel blessed. The Bohemian birds are adorable! Their faces somewhat remind me of those Mardi Gras masks — so artfully accented! Fabulous photos, Kat. I don’t see waxwings often, but when I do it’s in a gathering of dozens. Lovely birds. I am such a fan now it made me teary!! I watched the video three times,, Please tell me it’s real? I have seen nothing to suggest it is not real — isn’t it moving?! It is just soooo special. I love this!